Margaret Emerson is an artist living and working in central Massachusetts. 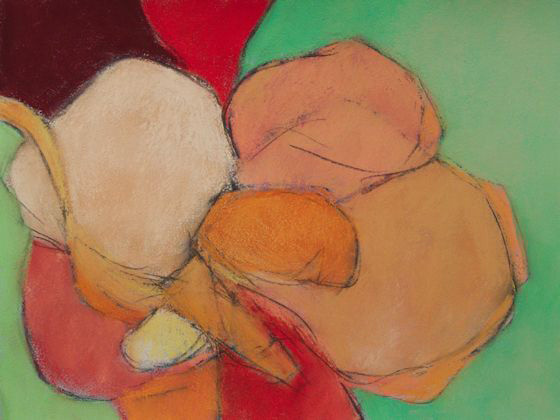 Her work has been shown in many regional and group exhibitions, including those of the Pastel Society of America, the Connecticut Pastel Society, the Maryland Pastel Society, the Pastel Society of New Hampshire, the Pastel Painters of Cape Cod, and the ArtsWorcester Biennial. She has won several awards for her work. Margaret has had some formal art training but is largely self-taught and goes her own way, working primarily in pastel and acrylic. Relationships of color and shape are her main interest, rather than specific subject matter. Her works are mostly grounded in nature and the natural forms of the earth, such as hills, rocks, plants and other natural forms. They are abstract and represent memories or impressions rather than specific places. Some have no relationship to anything concrete. All are intuitive.